Should Congress penalize schools that raise fees? 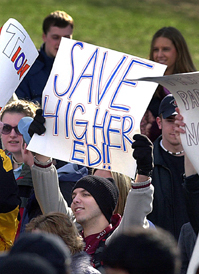 Tuition and fees at public colleges soared a record 14 percent this year, continuing a quarter-century trend of higher-education prices rocketing faster than inflation. And the average total cost of attending a private school jumped to $26,854 — far beyond the reach of most American families. The size of federal grants to students has not kept up with rising prices, and state appropriations to colleges have not kept up with burgeoning enrollments. Colleges have asked for increased government spending on higher education, but Republican congressional leaders say colleges are wasting money and are considering penalizing schools that hike prices. To cope with the financial crunch, more and more colleges are turning to innovative uses of technology to reduce their costs.